Royal Challengers Bangalore (RCB) will take on Delhi Capitals (DC) in the 21st match of the Indian Premier League - IPL 2019 on 7 April 2019 at M. Chinnaswamy Stadium, Bengaluru. As far as weather is concerned, it will be a warm afternoon with the temperature around 35°C during match hours. It looks a beautiful wicket to bat on. There is enough live grass on the wicket which suggests the ball will slide on. Occasionally, the ball might spin a little. It is a typical Chinnaswamy wicket which will have lots of runs. Nice even covering of grass. It is a six-hitting ground, the ball flies here. The Royal Challengers, yet to register a win this season, are placed at the bottom on the points table; losses all 5 matches. On the other hand, Delhi Capitals had a great start in the tournament but they have lost last two matches and are 6th on the points table with 2 wins and 3 loss in 5 matches. Royal Challengers Bangalore are clueless of what changes they had to make, probably they would be bringing Umesh Yadav in place of Mohammed Siraj. 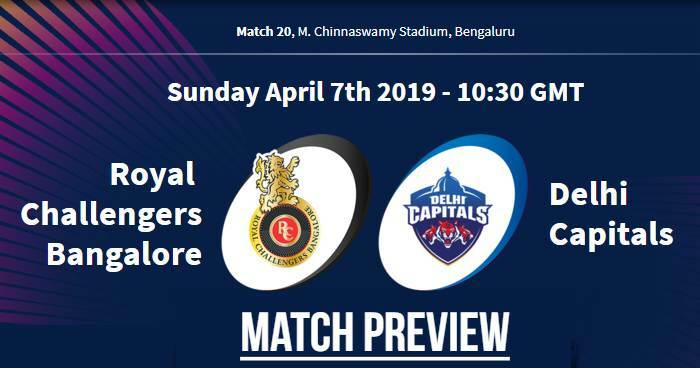 Delhi Capitals are likely to go unchanged in this match. Royal Challengers Bangalore (RCB) and Delhi Capitals (DD) have played 20 matches against each other in Indian Premier League (IPL) and one match was abandoned due to rain in 2015. Out of 20 matches in IPL, Royal Challengers Bangalore won 14 matches and remaining 6 matches was won by Delhi Capitals. Royal Challengers have defeated Delhi Capitals five consecutive times. At Chinnaswamy Stadium, Bengaluru; Royal Challengers Bangalore and Delhi Capitals have played 9 matches against each other and 1 match was abandoned due to rain. out of 9 matches; Royal Challengers Bangalore won 6 matches and Delhi Capitals won 3 matches. The overall economy rates of Royal Challengers Bangalore's fast bowlers has steadily worsened in the last few years; in 2015 the overall economy rate of their quicks was 8.19, in IPL 2016 it was 8.91, in IPL 2017 it was 8.88 and in IPL 2018 it was 9.01. So far in IPL 2019, it is 9.32. Delhi Capitals' Kagiso Rabada and Royal Challengers Bangalore's Navdeep Saini have bowled the two fastest deliveries in IPL 2019. Virat Kohli has scored 761 runs in 18 innings at an average of 69.18 against the Delhi Capitals which is his highest against any other IPL team. AB de Villiers has scored 396 runs in 9 innings, has an average of 79.20, and a strike-rate of 174.44 against Delhi Capitals in IPL. In his two innings last season, he scored 90* (39 balls) in Bengaluru and followed it up with 72* (37 balls) in Delhi. Rishabh Pant’s scores against Royal Challengers Bangalore are 1, 57, 45, 85 and 61. Playing XI for RCB: Virat Kohli (c), Parthiv Patel (wk), AB de Villiers, Marcus Stoinis, Moeen Ali, Akshdeep Nath, Yuzvendra Chahal, Pawan Negi, Navdeep Saini, Mohammed Siraj, Tim Southee. Playing XI for DC: Shreyas Iyer (c), Prithvi Shaw, Shikhar Dhawan, Rishabh Pant (wk), Colin Ingram, Chris Morris, Axar Patel, Kagiso Rabada, Rahul Tewatia, Ishant Sharma, Sandeep Lamichhane.